At first, our new Aire girl was called Shaggy which we turned into Sarah. She was surrendered to a shelter and ARG took her into our care. Sarah is a tall and lean Aire girl who weighs 77 lbs. 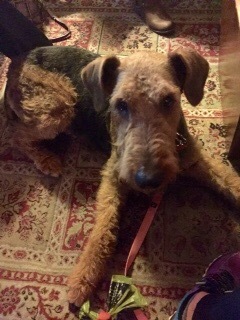 Timid at first, she has blossomed in foster care and is turning into a spunky fun Airedale. While in foster care, her name turned into Maggie! 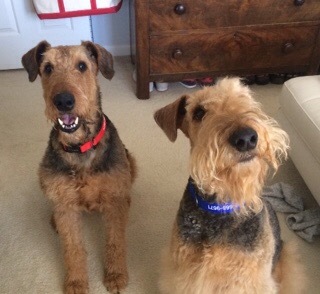 She has an Airedale brother who she currently lives with. Her foster mom goes to work and Maggie will stay during the day with her brother. A dog walker does come to let them out at one point during the long day. Maggie is a great leash walker. Maggie also likes to play and romp around in the backyard with her resident brother. 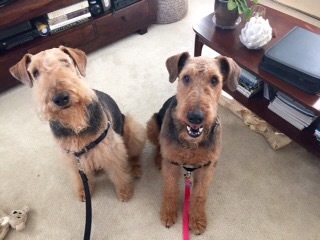 Maggie is very respectful that he is top dog in the family – except for Mom! Maggie’s brother is not available. Maggie wears red in the photos. Maggie enjoys living inside. She instantly knew how to jump on the couch. She sleeps on the bed and is a quiet easy car rider.